The import of professional learning in support of quality teaching is well established. Moreover, demonstrating active engagement with ongoing professional learning is now a requirement of maintaining teacher accreditation. For example, within an education policy climate that monitors the achievements of Indigenous learners closely, the evaluation and efficacy of educators with constructively addressing the experiences of these students is under increasing scrutiny, and hence, the significance of professional learning is further heightened. But, what sort of professional learning is well suited and effective in contributing to this undertaking? 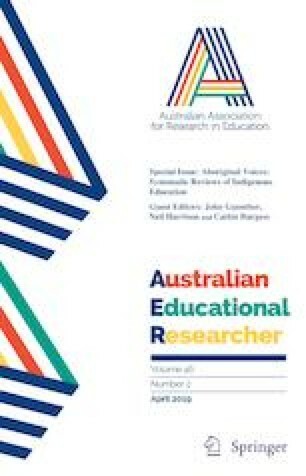 This systematic review investigated the veracity of the evidence underpinning professional learning research projects that aimed to make a positive change in the approach and abilities of schools to effectively improve the learning experiences of Indigenous students in Australia over the last 10 years. The themes that emerged from the review emphasise the import of future professional learning practices finding ways to more genuinely ensure that Indigenous peoples contribute to leading these activities, explicitly address issues to do with culture, (anti) racism, power and relationships in schooling, and localise the politics of knowledge construction through the alignment of curriculum, pedagogy and context. The original version of this article was revised: The co-authors’ names were missed in the author group. The author group has been updated. A correction to this article is available online at https://doi.org/10.1007/s13384-019-00324-4.